Mrs. Brassey : Surfriding at Hilo, 1876. A Voyage in the Sunbeam, our Home on the Ocean for Eleven Months. Longmans Green, and Company, London, 1878. 118 illustrations engraved on wood by G. Pearson chiefly after drawings by the Hon. A.Y. Bingham. Note that page numbers are not consistent with online versions. 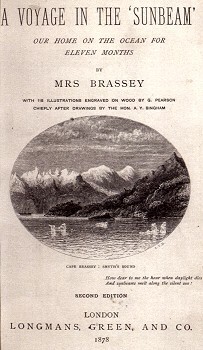 Anna Brassey, Baroness Brassey (née Allnutt) (October 7, 1839 – September 14, 1887) was an English traveller and writer. With her husband and five children they travelled around the world in 1876-1877 aboard their luxury yacht Sunbeam, the number of people on board was 43. 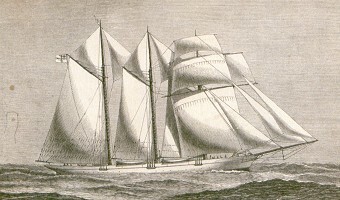 Her bestselling book, A Voyage in the Sunbeam, our Home on the Ocean for Eleven Months was published in 1878, ran through many English editions, and was translated into at least five other languages. Despite Brassey reporting that the party was equiped with "photographic apparatus" (page 281), no photographs are reproduced in the book, probably because at that time of publication this was either not technically possible or cost prohibitive. However, it is possible that some of the extensive wood-cut illustrations were based on the photographs. 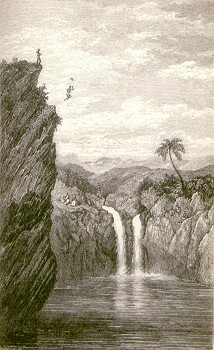 The account of cliff jumping at Hilo, an activity whose thrill has some similarities with surfriding, is interesting - note that one native completes a somersault, (turned over in mid-air) - page 278. In the surfriding report Brassey notes that the activity can probably be accomplished by Europeans - "I should think that to a powerful swimmer, with plenty of pluck, the feat is not difficult of accomplishment." "Four strong rowers took a whale-boat out into the worst surf, and then, steering her by means of a large oar, brought her safely back to the shore on the top of a huge wave." And all sports that sheperds are amoung. We went ashore at eight otclock, after an early cup of coffee, and found Mr. Lyman already waiting for us. Two baggage-mules were sent off with the photographic apparatus, and all the materials for breakfast, to the Rainbow Falls, where the children are looking forward with intense glee to boiling their own kettle, poaching eggs and trying other cooking experiments. Before setting out for the Falls ourselves we went to see the national sport of surf-swimming for their skill in which the Hawaiians are so justly famed. The natives have many other games of which they are very fond, and which they play with great skill, including spear-throwing, transfixing an object with a dart, kona, an elaborate kind of draughts, and talu, which consists in hiding a small stone under one of five pieces of cloth, placed in front of the players. With bows and arrows they are as clever as all savages, and wonderfully good shots, attemptlng many wonderful feats. They are swift as deer, when they choose, though somewhat lazy and indolent. All the kings and chiefs have been special adepts in the invigorating pastime of surf-swimming, and the present kings sisters are considered first-rate hands at it. ... about four feet long by two wide, pointed at each end - edgewise before them. For the return journey they select a large wave; and then, either sitting, kneeling, or standing on their boards, rush in shorewards with the speed of a racehorse, on the curling crest of the monster t enveloped in foam and spray, and holding on, as it were, by the milk-white manes of their furious coursers. It looked a most enjoyable amusement, and I should think that to a powerful swimmer, with plenty of pluck, the feat is not difficult of accomplishment. The natives here are almost amphibious. They played all sorts of tricks in the water, some of the performers beinging quite tiny boys. Four strong rowers took a whale-boat out into the worst surf, and then, steering her by means of a large oar, brought her safely back to the shore on the top of a huge wave.After the conclusion of this novel entertainment, we all proceeded on horseback to the Falls, Baby going in front of Tom, and Muriel riding with Mr. Freer. After a couple of miles we dismounted, and had a short walk through grass and ferns to a pretty double waterfall, tumbling over a cliff, about 100 feet high, into a glassy pool of the river beneath. It fell in front of a fern-filled black lava cavern, over which a rainbow generally hangs. As it was too wet to sit on the grass after the rain, we took possession of the verandah of a native house, commanding a fine view of the bay and town of Hilo. The hot coffee and eggs were a great success eventually, though the smoke from the wood fire nearly suffocated us in the process of cooking. Excellent also was some grey mullet, brought to us alive, and cooked native fashion, - wrapped up in ti leaves, and put into a hole in the ground. ... on the night of our arrival, and, tying up our horses out-side, walked across it to the banks of the river. Here we found a large party assembled, watching half the population of Hilo disporting themselves in, upon, and beneath the water. They climbed the almost perpendicular rocks on the opposite side of the stream, took headers, and footers, and siders from any height under five-and-twenty feet, dived, swam in every conceivable attitude, and with-out any apparent exertion, deep under the water, or upon its surface. But all this was only a preparation for the special sight we had come to see. Two natives were to jump from a precipice, 100 feet high, into the river below, clearing on their way a rock which projected some twenty feet from the face of the cliff, at about the same distance from the summit. The two men, tall, strong, and sinewy, suddenly appeared against the sky-line, far above our heads, their long hair bound back by a wreath of leaves and flowers, while another garland encircled their waists. Having measured their distance with an eagle's glance, they disappeared from our sight, in order to take a run and acquire the necessary impetus. Every breath was held for a moment, till one of the men reappeared, took a bound from the edge of the rock, turned over in mid-air, and disappeared feet foremost into the pool beneath, to emerge almost immediately, and to climb the sunny bank as quietly as if he had done nothing very wonderful. His companion followed, and then the two clambered up to the twenty- feet projection, to clear which they had had to take such a run the first time, and once more plunged into the pool below. The feat was of course an easier one than the first; but still a leap of eighty feet is no light matter. A third native, who joined them in this exploit, gave one quite a turn as he twisted in his downward jump; but he also alighted in the water feet foremost, and bobbed up again directly, like a cork. ... not more than a year ago, and had been laid up for six months in the hospital. We now moved our position a little higher up the river, to the Falls, over which the men, gliding down the shallow rapids above, in a sitting posture, allowed themselves to be carried. It looked a pleasant and easy feat, and was afterwards performed by many of the natives in all sorts of ways. Two or three of them would hold each other's shoulders, forming a child's train, or some would get on the backs of their companions, while others descended singly in a variety of attitudes. At last a young girl was also persuaded to attempt the feat. clear water, with her long black hair streaming out behind her. No description can give you any idea what an animated and extraordinary scene it was altogether. our Home on the Ocean for Eleven Months. Geoff Cater (2010) : Mrs. Brassey : Surfriding at Hilo, 1876.